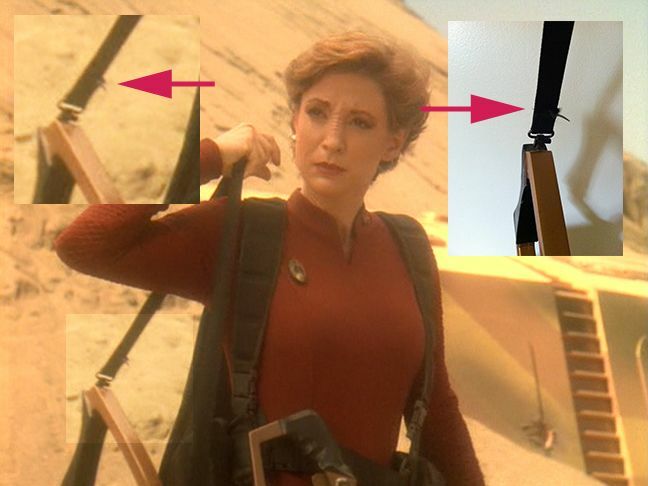 Bajoran Rifle - Screen matched! A guest blog by Brett Jones. Last month I was lucky enough to acquire this wonderful piece with impeccable provenance from Alec. 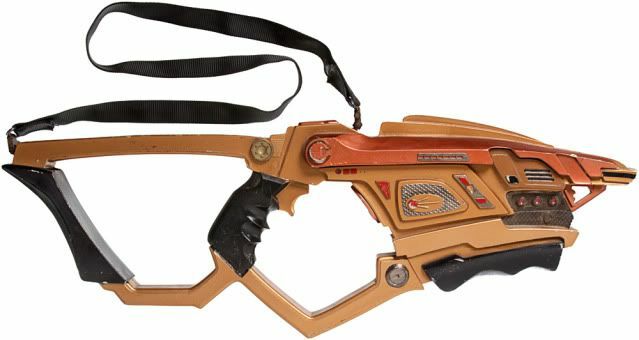 He obtained it directly from Doug Drexler prior to the Propworx auction in a direct sale. This piece is cast in lightweight resin and is the earliest example of the rifle having many details cast separately and then applied. Subsequent versions where molded as one piece and usually made out of rubber for the most part. With the help of Memory Alpha I was able to seek out and watch all of the episodes where it was used. 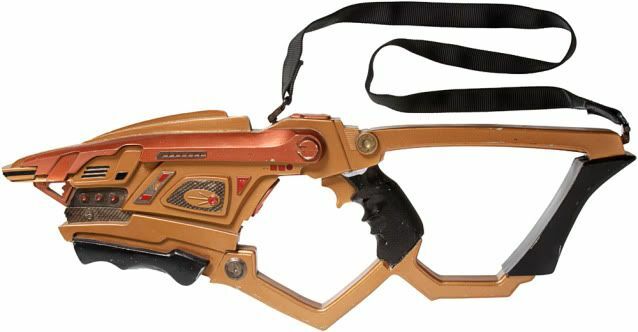 The first appearance of the Bajoran rifle was in "Shakaar" but there were a few being used and no close-ups of any kind. Was it used there? Probably, but no solid proof. On to the next episode which was "Indescretions", one of my all time favorites. 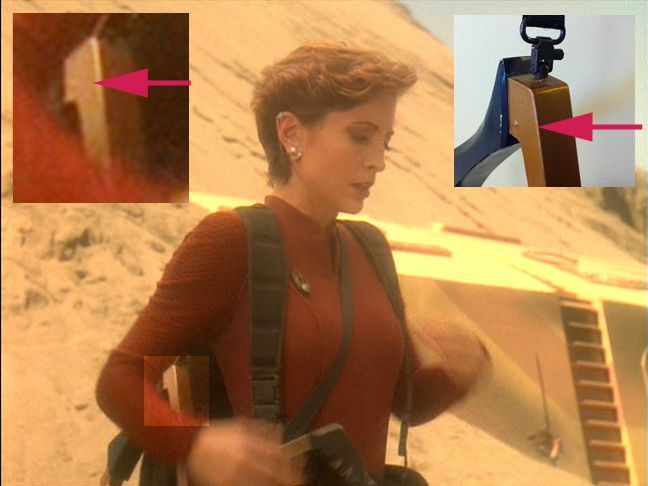 What are the odds that I had the rifle that Kira carries around for a while until she trades it in for a Breen rifle? As it turns out - Pretty Good! 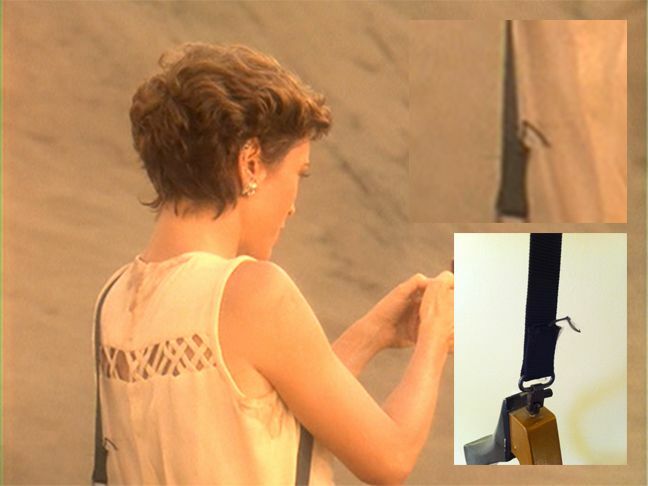 This illustrates the fraying strap which I thought for sure happened over time. Next scene is inside the ship where she obtains a crew manifest. The rifle is on it's side facing the camera with the top to the left and stock/grip to the right and slightly up. Lots of arrows here and granted my pic is a little nose heavy but getting these angles is tough. Rust colored piece has same two chips as the screen cap - I can clearly see them in photoshop but they are defiantly obscured but still present in this low light environment. Chip and line on gold piece next to black grip. Chip is smaller in cap but in exactly the same place. Chips in black grip at piont of arrow match exactly. 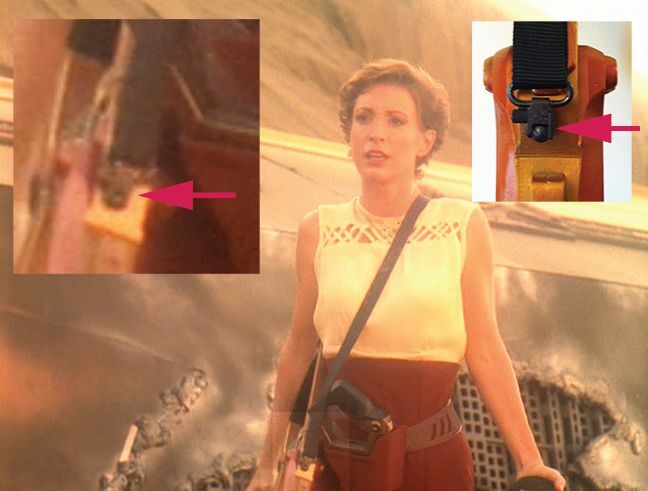 Also not shown - when she later picks the rifle up the fray on the strap can be clearly seen in a single frame. 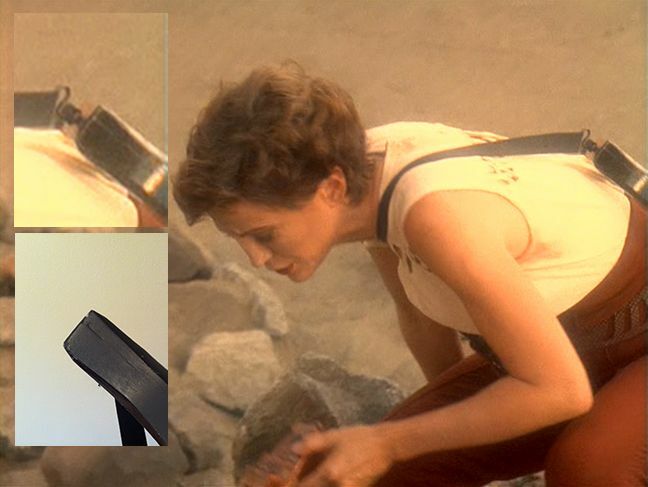 Back outside to tell Dukat what she found and we see the forward attachment point for the strap. It happens to be way off center... which is good in this case. 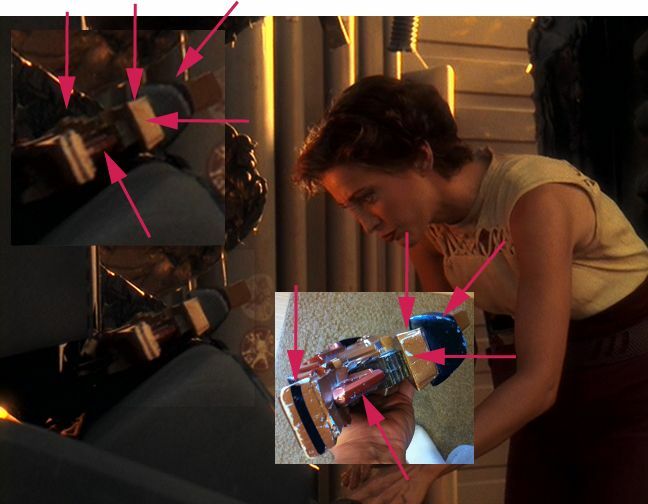 Next scene she kneels down to look through some ear rings and we see the un sanded mold line on the stock. The angle is a bit different to show the seam in the light i had to work with. She scans for the homing beacons and we see the frayed strap again much more clearly. Not a bad days work! I will keep on going with other episodes but this is honestly good enough for me. 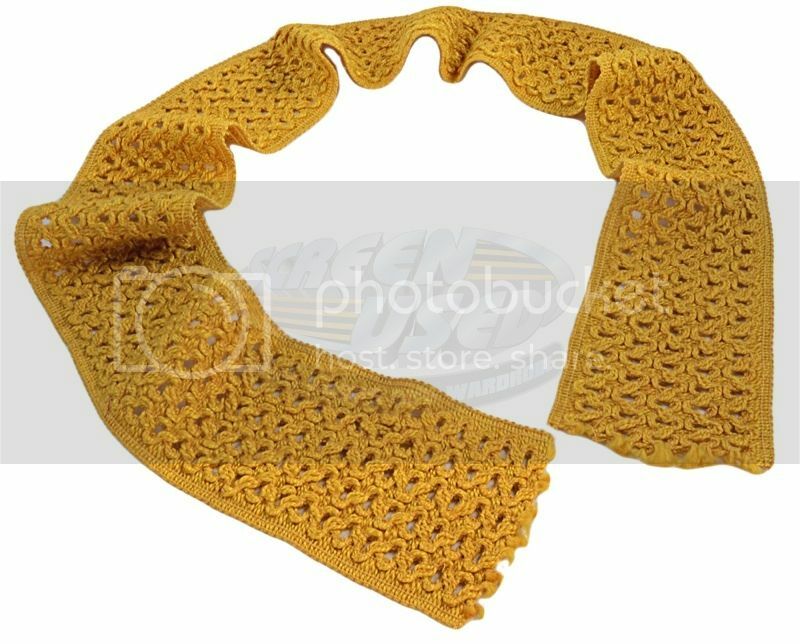 There is a Vulcan Sash from TOS on eBay. You can see it here. 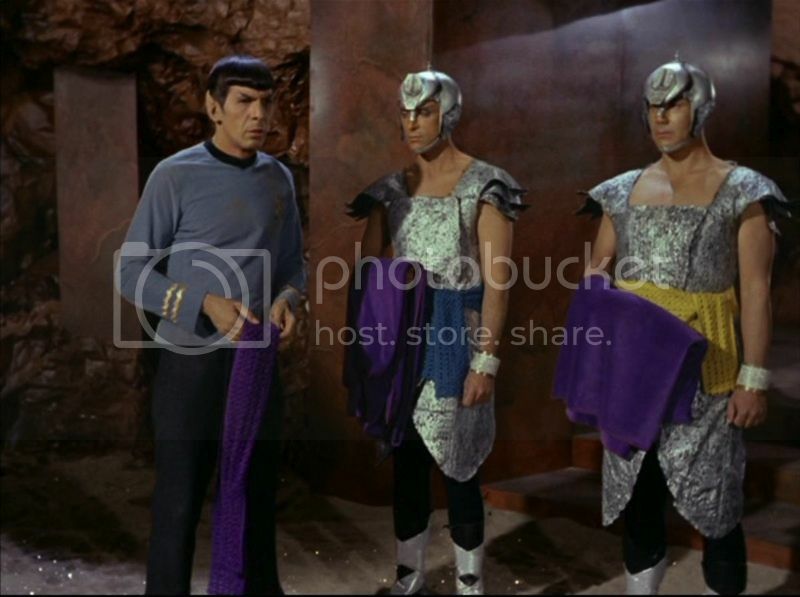 Star Trek TOS Production Made Vulcan Sash as seen in the episode "Amok Time". Was originally purchased from William Theiss (Costume Designer for TOS Star Trek). Sash is 5 feet long and 5 inche wide. COA from Screen Used is included. I like this item and think it is a great piece of TOS history. It says it came from Bill Theiss, which is solid. I think that things like this, that you can pick up under $ 1,000 are great TOS buys.